SignalSilence® ULK1 siRNA I from Cell Signaling Technology (CST) allows the researcher to specifically inhibit ULK1 expression using RNA interference, a method whereby gene expression can be selectively silenced through the delivery of double stranded RNA molecules into the cell. All SignalSilence® siRNA products from CST are rigorously tested in-house and have been shown to reduce target protein expression by western analysis. 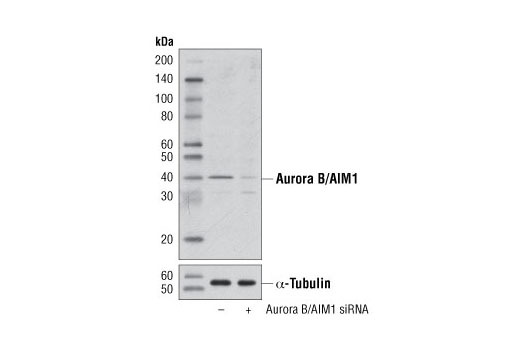 SignalSilence® Aurora B/AIM1 siRNA I from Cell Signaling Technology (CST) allows the researcher to specifically inhibit Aurora B/AIM1 expression using RNA interference, a method whereby gene expression can be selectively silenced through the delivery of double stranded RNA molecules into the cell. All SignalSilence® siRNA products from CST are rigorously tested in-house and have been shown to reduce target protein expression by western analysis. Background: Aurora kinases belong to a highly conserved family of mitotic serine/threonine kinases with three members identified among mammals: Aurora A, B, and C (1,2). Studies on the temporal expression pattern and subcellular localization of Aurora kinases in mitotic cells suggest an association with mitotic structure. Aurora kinase functional influences span from G2 phase to cytokinesis and may be involved in key cell cycle events such as centrosome duplication, chromosome bi-orientation and segregation, cleavage furrow positioning, and ingression (3). Aurora A is detected at the centrosomes, along mitotic spindle microtubules, and in the cytoplasm of mitotically proliferating cells. Aurora A protein levels are low during G1 and S phases and peak during the G2/M phase of the cell cycle. 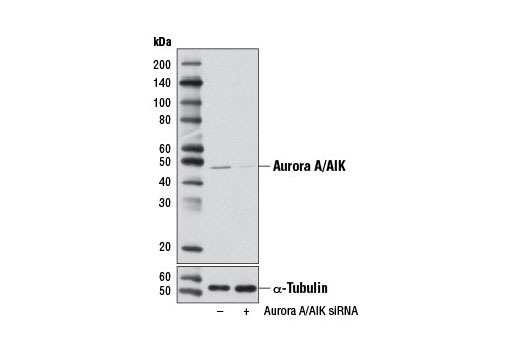 Phosphorylation of Aurora A at Thr288 in its catalytic domain increases kinase activity. Aurora A is involved in centrosome separation, maturation, and spindle assembly and stability. Expression of Aurora B protein also peaks during the G2/M phase of the cell cycle; Aurora B kinase activity peaks at the transition from metaphase to the end of mitosis. Aurora B associates with chromosomes during prophase prior to relocalizing to the spindle at anaphase. Aurora B regulates chromosome segregation through the control of microtubule-kinetochore attachment and cytokinesis. Expression of both Aurora A and Aurora B during the G2/M phase transition is tightly coordinated with histone H3 phosphorylation (4,5); research investigators have observed overexpression of these kinases in a variety of human cancers (2,4). Aurora C localizes to the centrosome from anaphase to cytokinesis and both mRNA and protein levels peak during G2/M phase. 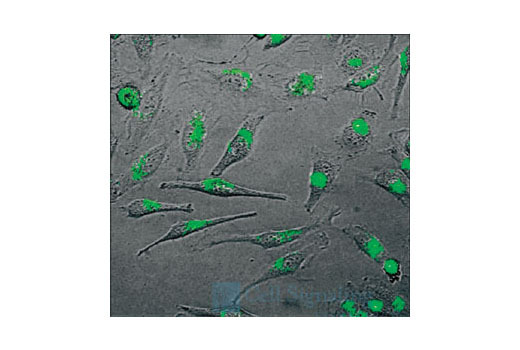 Although typical Aurora C expression is limited to the testis, research studies report overexpression of Aurora C is detected in various cancer cell lines (6). 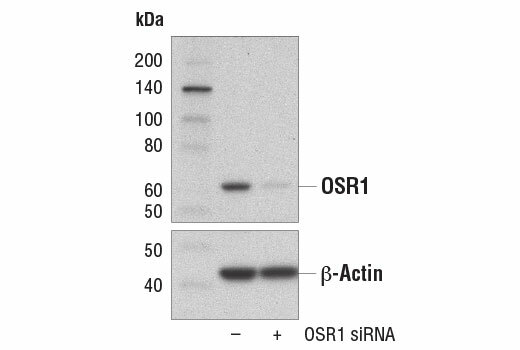 SignalSilence® OSR1 siRNA I from Cell Signaling Technology (CST) allows the researcher to specifically inhibit OSR1 expression using RNA interference, a method whereby gene expression can be selectively silenced through the delivery of double stranded RNA molecules into the cell. All SignalSilence® siRNA products from CST are rigorously tested in-house and have been shown to reduce target protein expression by western analysis. Background: SPAK (STE20/SPS1-related Pro/Ala-rich kinase) and OSR1 (oxidative stress responsive 1) are members of the GCK family serine/threonine kinases. Overexpression and in vitro studies demonstrate that SPAK is able to activate p38 MAP kinase indicating a possible role for SPAK in the stress response (1). Yeast two-hybrid screening revealed that SPAK and OSR1 bind to Na-K-2Cl cotransporters NKCC1 and NKCC2 and K-Cl cotransporter KCC3 (2). 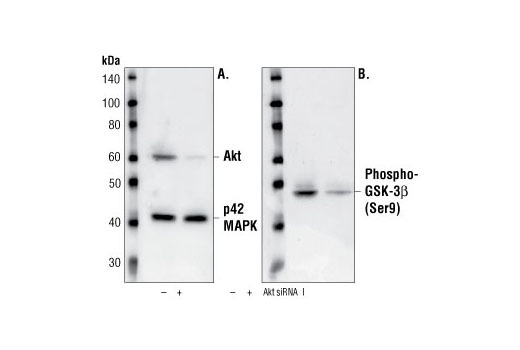 WNK1 and WNK4 phosphorylate SPAK at Thr243/247 and Ser380 (3-5). Similarly, WNK1 and WNK4 phosphorylate OSR1 at Thr185 and Ser315 (3,4). Phosphorylation at these sites stimulates SPAK and OSR1 activity, leading to NKCC1 phosphorylation and enhanced NKCC1 activity (3-5). SPAK is also phosphorylated at Ser311 by PKCθ in response to T cell activation. Substitution of Ser311 with Ala or specific siRNA knock-down of SPAK dramatically reduces TCR/CD28-induced AP-1 activation, suggesting SPAK is involved in T cell signaling as well (6). 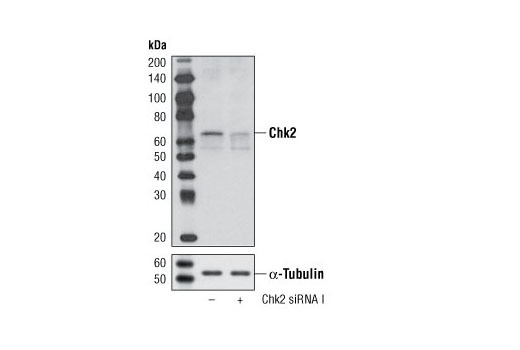 SignalSilence® Chk2 siRNA I from Cell Signaling Technology (CST) allows the researcher to specifically inhibit Chk2 expression using RNA interference, a method whereby gene expression can be selectively silenced through the delivery of double stranded RNA molecules into the cell. All SignalSilence® siRNA products from CST are rigorously tested in-house and have been shown to reduce target protein expression by western analysis. 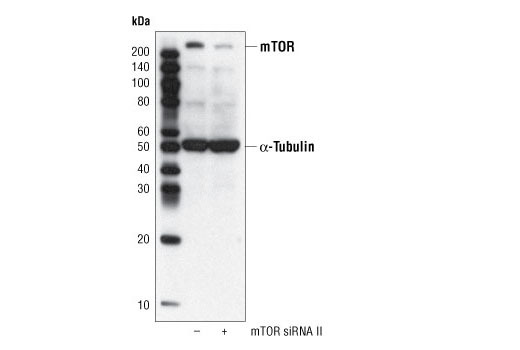 SignalSilence® mTOR siRNA II (Mouse Specific) from Cell Signaling Technology (CST) allows the researcher to specifically inhibit mTOR expression using RNA interference, a method whereby gene expression can be selectively silenced through the delivery of double stranded RNA molecules into the cell. All SignalSilence® siRNA products from CST are rigorously tested in-house and have been shown to reduce target protein expression by western analysis. 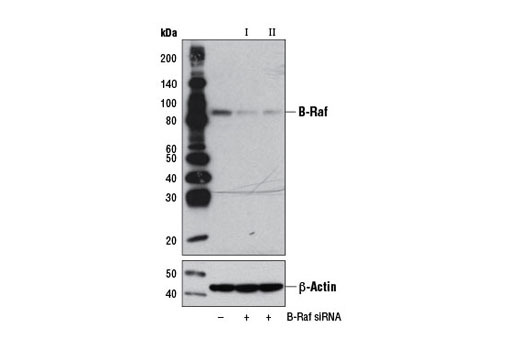 SignalSilence® B-Raf siRNA I from Cell Signaling Technology (CST) allows the researcher to specifically inhibit B-Raf expression using RNA interference, a method whereby gene expression can be selectively silenced through the delivery of double stranded RNA molecules into the cell. All SignalSilence® siRNA products from CST are rigorously tested in-house and have been shown to reduce target protein expression by western analysis. Background: A-Raf, B-Raf, and c-Raf (Raf-1) are the main effectors recruited by GTP-bound Ras to activate the MEK-MAP kinase pathway (1). Activation of c-Raf is the best understood and involves phosphorylation at multiple activating sites including Ser338, Tyr341, Thr491, Ser494, Ser497, and Ser499 (2). p21-activated protein kinase (PAK) has been shown to phosphorylate c-Raf at Ser338, and the Src family phosphorylates Tyr341 to induce c-Raf activity (3,4). Ser338 of c-Raf corresponds to similar sites in A-Raf (Ser299) and B-Raf (Ser445), although this site is constitutively phosphorylated in B-Raf (5). Inhibitory 14-3-3 binding sites on c-Raf (Ser259 and Ser621) can be phosphorylated by Akt and AMPK, respectively (6,7). While A-Raf, B-Raf, and c-Raf are similar in sequence and function, differential regulation has been observed (8). Of particular interest, B-Raf contains three consensus Akt phosphorylation sites (Ser364, Ser428, and Thr439) and lacks a site equivalent to Tyr341 of c-Raf (8,9). Research studies have shown that the B-Raf mutation V600E results in elevated kinase activity and is commonly found in malignant melanoma (10). Six residues of c-Raf (Ser29, Ser43, Ser289, Ser296, Ser301, and Ser642) become hyperphosphorylated in a manner consistent with c-Raf inactivation. The hyperphosphorylation of these six sites is dependent on downstream MEK signaling and renders c-Raf unresponsive to subsequent activation events (11). 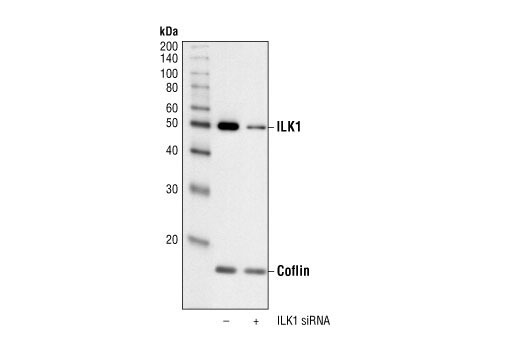 SignalSilence® ILK1 siRNA I from Cell Signaling Technology (CST) allows the researcher to specifically inhibit ILK1 expression using RNA interference, a method whereby gene expression can be selectively silenced through the delivery of double stranded RNA molecules into the cell. All SignalSilence® siRNA products from CST are rigorously tested in-house and have been shown to reduce target protein expression by western analysis. Background: Integrin-linked kinases (ILKs) couple integrins and growth factors to downstream pathways involved in cell survival, cell cycle control, cell-cell adhesion and cell motility (1). ILK functions as a scaffold bridging the extracellular matrix (ECM) and growth factor receptors to the actin cytoskeleton through interactions with integrin, PINCH (which links ILK to the RTKs via Nck2), CH-ILKBP and affixin (1). ILK phosphorylates Akt at Ser473, GSK-3 on Ser9, myosin light chain 2 (MLC2) on Ser18/Thr19, as well as affixin (2-5). These phosphorylation events are key regulatory steps in modulating the activities of the targets. 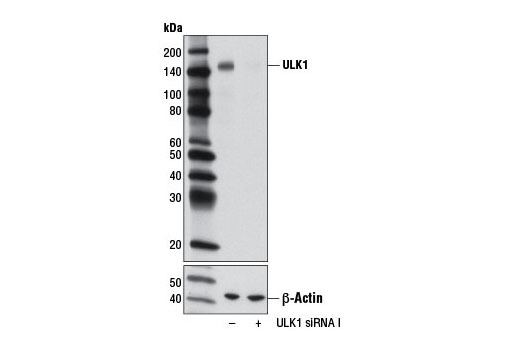 ILK activity is stimulated by PI3 kinase and negatively regulated by the tumor suppressor PTEN and a PP2C protein phosphatase, ILKAP (1,3,6). It has been suggested that the conserved Ser343 residue in the activation loop plays a key role in the activation of ILK1 (2). 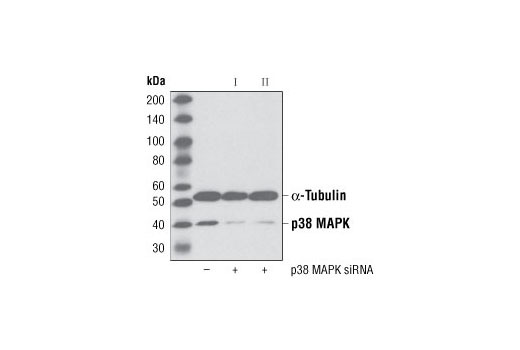 SignalSilence® p38 MAP Kinase siRNA II from Cell Signaling Technology (CST) allows the researcher to specifically inhibit p38 MAP kinase expression using RNA interference, a method whereby gene expression can be selectively silenced through the delivery of double stranded RNA molecules into the cell. All SignalSilence® siRNA products from CST are rigorously tested in-house and have been shown to reduce target protein expression by western analysis. 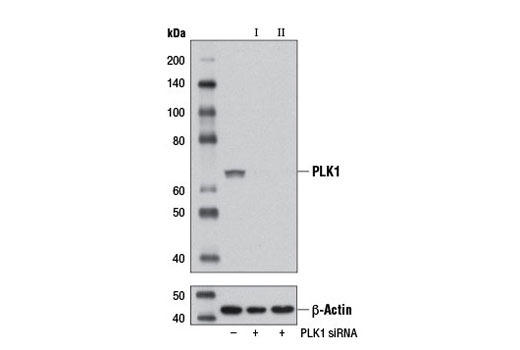 SignalSilence® PLK1 siRNA I from Cell Signaling Technology (CST) allows the researcher to specifically inhibit PLK1 expression using RNA interference, a method whereby gene expression can be selectively silenced through the delivery of double stranded RNA molecules into the cell. All SignalSilence® siRNA products from CST are rigorously tested in-house and have been shown to reduce target protein expression by western analysis. Background: At least four distinct polo-like kinases exist in mammalian cells: PLK1, PLK2, PLK3, and PLK4/SAK (1). PLK1 apparently plays many roles during mitosis, particularly in regulating mitotic entry and exit. The mitosis promoting factor (MPF), cdc2/cyclin B1, is activated by dephosphorylation of cdc2 (Thr14/Tyr15) by cdc25C. PLK1 phosphorylates cdc25C at Ser198 and cyclin B1 at Ser133 causing translocation of these proteins from the cytoplasm to the nucleus (2-5). PLK1 phosphorylation of Myt1 at Ser426 and Thr495 has been proposed to inactivate Myt1, one of the kinases known to phosphorylate cdc2 at Thr14/Tyr15 (6). Polo-like kinases also phosphorylate the cohesin subunit SCC1, causing cohesin displacement from chromosome arms that allow for proper cohesin localization to centromeres (7). Mitotic exit requires activation of the anaphase promoting complex (APC) (8), a ubiquitin ligase responsible for removal of cohesin at centromeres, and degradation of securin, cyclin A, cyclin B1, Aurora A, and cdc20 (9). 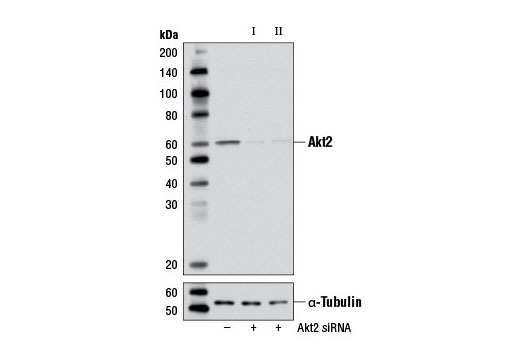 PLK1 phosphorylation of the APC subunits Apc1, cdc16, and cdc27 has been demonstrated in vitro and has been proposed as a mechanism by which mitotic exit is regulated (10,11).Substitution of Thr210 with Asp has been reported to elevate PLK1 kinase activity and delay/arrest cells in mitosis, while a Ser137Asp substitution leads to S-phase arrest (12). In addition, while DNA damage has been found to inhibit PLK1 kinase activity, the Thr210Asp mutant is resistant to this inhibition (13). PLK1 has been reported to be phosphorylated in vivo at Ser137 and Thr210 in mitosis; DNA damage prevents phosphorylation at these sites (14). 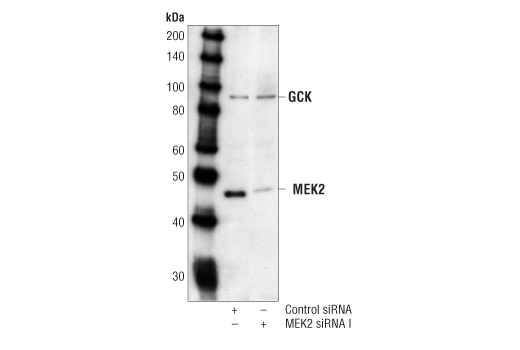 SignalSilence® MEK2 siRNA from Cell Signaling Technology allows the researcher to specifically inhibit MEK2 expression using RNA interference, a method in which gene expression can be selectively silenced through the delivery of double stranded RNA molecules into the cell. All SignalSilence® siRNA products are rigorously tested in-house and have been shown to reduce protein expression in specified cell lines. 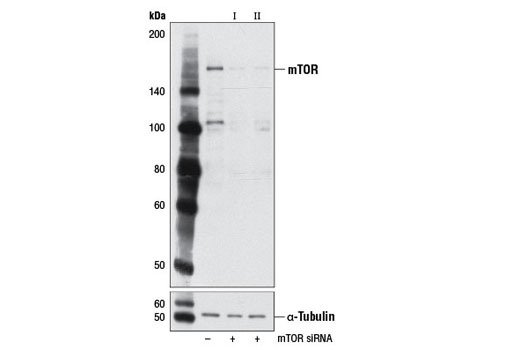 SignalSilence® mTOR siRNA II from Cell Signaling Technology allows the researcher to specifically inhibit mTOR expression using RNA interference, a method whereby gene expression can be selectively silenced through the delivery of double stranded RNA molecules into the cell. All SignalSilence® siRNA products are rigorously tested in-house and have been shown to reduce target protein expression by western analysis. 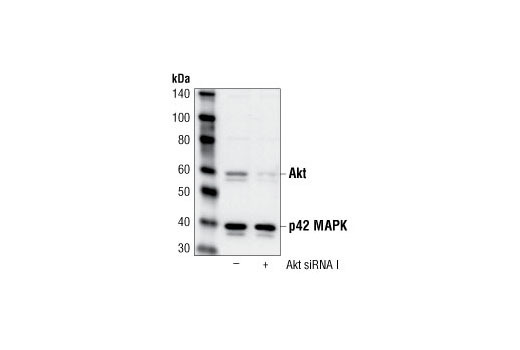 SignalSilence® PKD2 siRNA I from Cell Signaling Technology (CST) allows the researcher to specifically inhibit PKD2 expression using RNA interference, a method whereby gene expression can be selectively silenced through the delivery of double stranded RNA molecules into the cell. All SignalSilence® siRNA products from CST are rigorously tested in-house and have been shown to reduce target protein expression by western analysis. 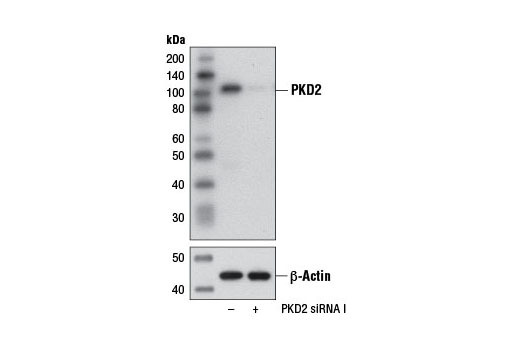 Background: Protein kinase D2 (PKD2) is one of three members of the protein kinase D family, including PKD1/PKCμ and PKD3/PKCν, that belong to the calcium/calmodulin superfamily of serine/threonine protein kinases (1,2). PKDs contain a conserved, carboxy-terminal catalytic domain, an amino-terminal regulatory region hallmarked by a PH domain that coordinates subcellular localization, and two zinc-finger/C1 lipid-binding domains that mediate activation of the enzyme in response to diacylglycerol (DAG) or phorbol ester (2,3). In addition to lipid-mediated activation, PKD catalytic activity can also be stimulated via phosphorylation of critical serine residues within the activation loop of the enzyme (4-8). Novel PKCs, such as PKCη and PKCε, have been shown to phosphorylate PKD1 at Ser744 and Ser748 (Ser706 and Ser710 in human PKD2), resulting in alleviation of autoinhibition of the enzyme mediated by PH domain interactions with the catalytic domain (5). Phosphorylation and activation of PKD isoforms has also been described for other upstream kinases. 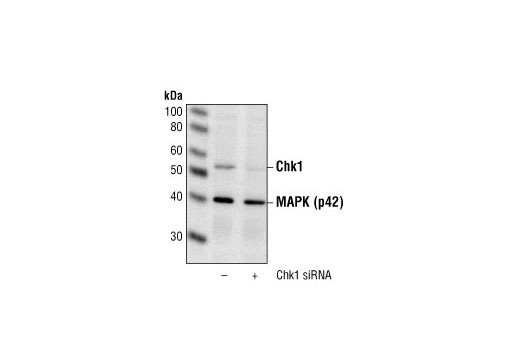 For example, casein kinase 2 (CK2) has been shown to phosphorylate PKD2 at Ser244, which promotes nuclear accumulation of PKD2, phosphorylation of HDAC7, and expression of Nur77 (9). Although only a handfull of PKD2 effectors have been identified, PKD2 has been implicated in regulating an array of cellular events, including cell survival, development, growth, migration, and transformation (10-14). 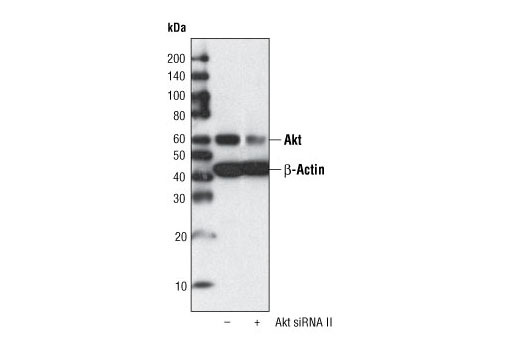 PKD2-mediated phosphorylation of at least one known substrate, phosphatidylinositol 4-kinase type IIIβ (PI4KIIIβ), also implicates PKD2 in the formation and regulation of exocytotic transport vesicles from the trans Golgi network (15). 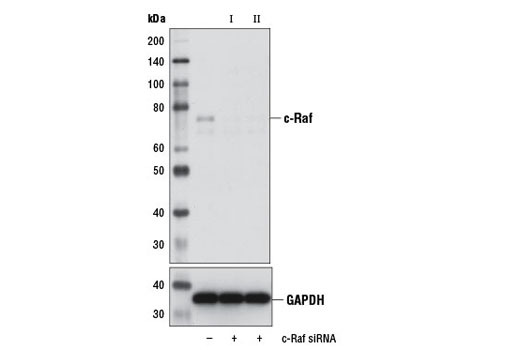 SignalSilence® c-Raf siRNA I from Cell Signaling Technology (CST) allows the researcher to specifically inhibit c-Raf expression using RNA interference, a method whereby gene expression can be selectively silenced through the delivery of double stranded RNA molecules into the cell. All SignalSilence® siRNA products from CST are rigorously tested in-house and have been shown to reduce target protein expression by western analysis. 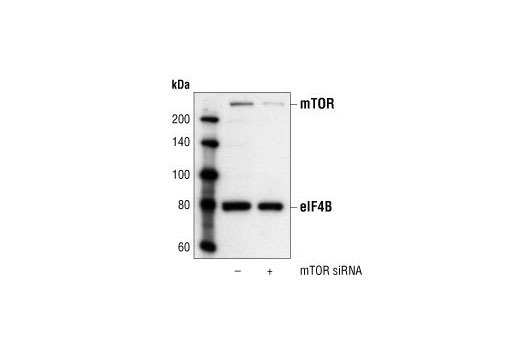 SignalSilence® mTOR siRNA I (Mouse Specific) from Cell Signaling Technology (CST) allows the researcher to specifically inhibit mTOR expression using RNA interference, a method whereby gene expression can be selectively silenced through the delivery of double stranded RNA molecules into the cell. All SignalSilence® siRNA products from CST are rigorously tested in-house and have been shown to reduce target protein expression by western analysis.